Handmade luxury leather prescription pad holders are one of the best gifts for doctors and those who deal with medical patients. They are a convenient and elegant way to handle patient care in a style of your own with these fine leather prescription pad holders crafted in luxury calf skin. We offer handmade physicians pad holders from some of our renowned luxury leather goods. Select a medical doctor's prescription pad holder in the leather and color that is appropriate for the tastes and style of a world class doctor. The Pineider 1774 Leather Prescription Pad Holder is handmade in matte ebony (dark brown) Rugato calf skin. The Pineider City Chic Leather Prescription Pad Holder is handmade in black veau grainé calf for the physician with sophisticated and minimalist tastes. The Pineider 1949 Prescription Pad Holder is crafted in classic Italian calf with chrome details in a choice of black, brown, or green leather. We offer personalized leather prescription pad holders for those with a strong sense of style or who prefer leather accessories with a unique touch. Buy a personalized leather prescription pad holders with name, monogram, initials, or logo as required. 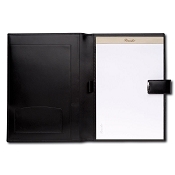 We can offer custom leather prescription pad holders in an expanded range of colors with logo and name as required. Our expensive leather prescription pad holders are handmade in same top quality leathers from our luxury leather goods collections. They are crafted by the finest leather artisans from the finest leather brands. These expensive leather prescription pad holders are world class leather articles meant for the finest of medical professionals.